Brisbane Lord Mayor Graham Quirk came under fire in this week’s city council meeting for the revenue shortfall of $866,000 for the Go Between Bridge. The loss was revealed in last week’s Brisbane City Council budget review. Labor also criticised the Liberal National Party administration for the cost of collecting tolls. “We also discovered motorists are paying 40 cents in every dollar to a private business, just to collect their toll money,” Cr Kim Flesser said. But Cr Quirk defended the expenditure. “This is where Labor completely missed the point … was the Go Between Bridge needed in this city? Absolutely,” he said. Cr Quirk said that the toll was “everyday helping to repay some of the costs in relation to that bridge”. 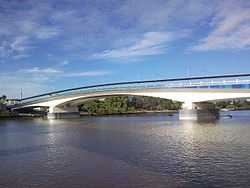 “I love it when they knock the Go Between Bridge because I know that the people of Brisbane wanted that project, they are using that project, and it will continue for many many years to come to serve the people very well,” he said.